Image: (L to R) Ed Bourgeois (Mohawk), Dr. Carolyn M. Dunn (Muskogee Creek/Cherokee/Tunica-Choctaw-Biloxi), and Frank Henry Kaash Katasse (Tlingit). 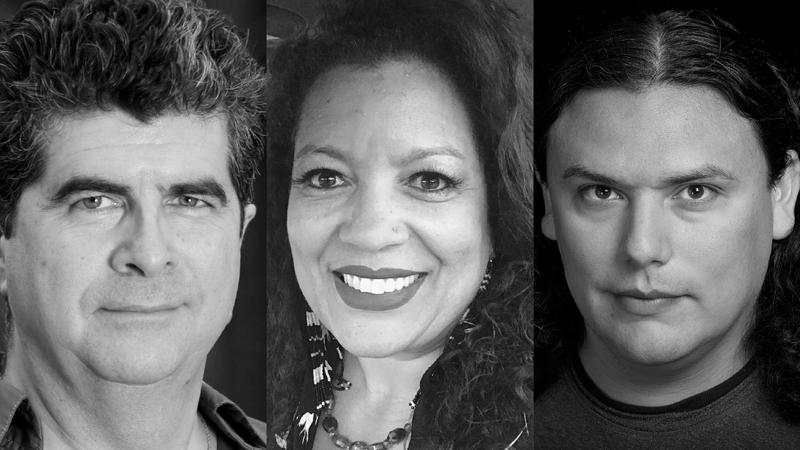 Los Angeles, CA (May 30, 2018)— Native Voices at the Autry, America’s leading Native American theatre company, presents its 24th Annual Festival of New Plays at the Autry Museum of the American West and La Jolla Playhouse. The festival features staged readings of new and in-progress plays by Native writers followed by talkbacks in which each audience member becomes an important part of the collaborative process. A weeklong playwrights retreat preceding Native Voices’ highly respected festival brings together beginning, emerging, and established Native American playwrights who shape their plays with nationally recognized directors, dramaturgs, and an acting company of exceptional Native American actors. Over the past eighteen months, the American stage has seen an explosion of Native theatre produced by prestigious theatre companies across the country. Many of these plays and playwrights developed their talents and work through Native Voices Annual Playwrights Retreat and Festival of New Plays including Bingo Hall (2018), Fairly Traceable (2017), They Don't Talk Back (2016), and Off the Rails (2015). They continue to excite new audiences and demonstrate that changing the stories we tell can change the culture of an art form, its artists, institutions, and audiences. Native Voices at the Autry is proud to contribute to the success of the field by supporting new work and championing Native playwrights and theater artists. A Mohawk man searches for his family tree only to discover a lost and violent past. Could these shadows be the clue to finding a cure for his daughter's disease? Ed Bourgeois partnered with Native Voices to develop the Alaska Native Playwrights Project, which trained 32 new Native playwrights from 2010–2013. Two of his own plays have been included in Native Voices’ Short Play Festival: Trail Trees (2017) and Backstage, Blue Moon (2016), which won the Von Marie Atchley Excellence in Playwriting Award. His River of Blood received a staged reading in Oklahoma City Theatre Company’s 2017 Native American New Play Festival and returns to OKCTC following the 2018 Festival of New Plays. The Autry: Wednesday, June 6, 4:00 p.m.
La Jolla Playhouse: Saturday, June 9, 1:00 p.m.
A teenager finds old cassette tapes of her Cherokee father's once-famous pow wow songs and presents them as her senior project. Will the surprise be a welcome one for her single dad? Carolyn M. Dunn, PhD., work has been recognized by the Wordcraft Circle of Storytellers and Writers as Book of the Year for poetry (Outfoxing Coyote, 2002) as well as the Year's Best Short Story (Salmon Creek Road Kill, 1999); Native American Music Awards and the Humbolt Area Foundation for the Mankillers' Comin to Getcha. In addition to Outfoxing Coyote, her books include Through the Eye of the Deer (Aunt Lute Books, 1999); Hozho: Walking in Beauty (McGraw Hill, 2002); Coyote Speaks (H.N. Abrams, 2008); Echolocation: Poems, Stories and Songs from Indian Country: L.A. (Fezziweg Press, 2013); and The Stains of Burden and Dumb Luck (Mongrel Empire Press, 2017). Two of her plays, The Frybread Queen and Ghost Dance, have been developed and staged at Native Voices at the Autry in Los Angeles. The Autry: Wednesday, June 6, 7:30 p.m.
La Jolla Playhouse: Sunday, June 10, 1:00 p.m.
A young Tlingit woman contemplates life and death after the birth of her daughter and realizes that her past has made her stronger than she ever knew possible. Frank Henry Kaash Katasse is an actor, director, producer, improviser, educator, and playwright. Frank received his Bachelor’s Degree in Theatre Arts from the University of Hawaii: Mānoa. Frank is currently the Board President of Juneau Douglas Little Theatre and works at Perseverance Theatre. He is passionate about developing new Alaskan plays for the stage. Frank now lives and works in Douglas, Alaska with his wife and two children. The Autry: Thursday, June 7, 7:30 p.m.
La Jolla Playhouse: Saturday, June 9, 4:00 p.m. Native Voices at the Autry is the only Equity theatre company devoted exclusively to developing and producing new works for the stage by Native American, Alaska Native, and First Nations playwrights. The theatre company is committed to putting Native narratives at the center of the American story in order to facilitate a more inclusive dialog on what it means to be American. Founded in 1994 by Producing Artistic Director Randy Reinholz (Choctaw) and Producing Executive Director Jean Bruce Scott, Native Voices became the resident theatre company at the Autry Museum of the American West in 1999. The company provides a supportive, collaborative setting for Native theatre artists from across North America. In 2014 the company established the Native Voices Artists Ensemble to more fully support the extraordinary talents of its Native actors, writers, musicians, and directors. The Ensemble is devoted to developing new work in a collaborative process as well as supporting Native Voices’ ongoing focus on the work of individual playwrights. Native Voices is pleased to return for a second year as the resident theatre company at the Tony award winning La Jolla Playhouse through the 2017/2018 season. Native Voices at the Autry is a member of Actors’ Equity Association, LA Stage Alliance, and the Dramatists Guild, an associate member of the National New Play Network and is a Constituent Theatre of Theatre Communications Group (TCG), the national organization for the American theatre. Visit TheAutry.org/NativeVoices for more information. The Tony Award-winning La Jolla Playhouse is internationally-renowned for creating some of the most exciting and adventurous work in American theatre, through its new play development initiatives, its innovative Without Walls series, artist residencies and commissions. Led by Artistic Director Christopher Ashley and Managing Director Michael S. Rosenberg, the Playhouse was founded in 1947 by Gregory Peck, Dorothy McGuire, and Mel Ferrer, and reborn in 1983 under the artistic leadership of Des McAnuff, La Jolla Playhouse has had 28 productions transfer to Broadway, garnering 35 Tony Awards, among them the currently-running Come From Away and Indecent, as well as Jersey Boys, Memphis, The Who’s Tommy, Big River, as well as Billy Crystal’s 700 Sundays and the Pulitzer Prize-winning I Am My Own Wife, both fostered as part of the Playhouse’s Page To Stage Program. Visit www.LaJollaPlayhouse.org. WHEN: June 6-7 at the Autry in Los Angeles. June 9-10 at La Jolla Playhouse in San Diego. Wednesday, June 6, 4:00 p.m.
Wednesday, June 6, 7:30 p.m.
Saturday, June 9, 1:00 p.m.
Sunday, June 10, 1:00 p.m.
At the Autry, Crossroads West Cafe will offer light fare for purchase on June 6–7 from 5:30–7:30 p.m.